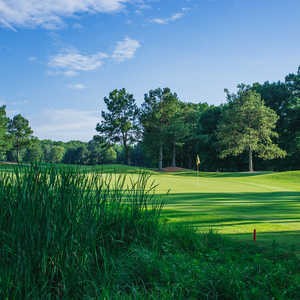 With two Arthur Hills golf courses offering a distinct duo of challenges, the Golf Club of Georgia is in front rank of Atlanta-area clubs, which places among Georgia golf's best. 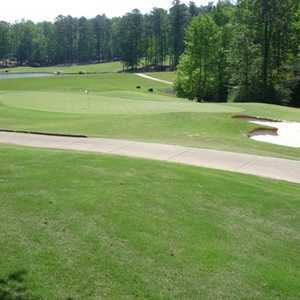 The Golf Club of Georgia has two distinctively different courses, Creekside and Lakeside. ALPHARETTA, Ga. - The Golf Club of Georgia has two superb courses, and which one you prefer (or fear) says a lot about the kind of golfer you are. Pros and golfers with low handicaps are likely to tab Lakeside the more challenging, in large part because of the subversive nature of the greens complexes. Mid- to high handicappers are more apt to quake at Creekside's many water carries. Which to play? The heck with it, flip a coin. Heads or tails, you can't go wrong. Lakeside won recognition right off the bat, scoring Golf Digest's honors for best new private course after it opened in 1990. The track winds up, down and around the moderate Georgia hills, giving the layout graceful movement and a strategic element. "Lakeside was built on higher, rolling ground covered with pine trees and hardwoods," according to Arthur Hills, who designed both tracks here. "In general we made an effort to work the golf holes down through the valleys." With its multi-leveled fairways, Lakeside plays almost like a game of 3D chess. Hills gives you angles off the tee and fairways, and you have to think two steps ahead. The fairways are sloped and banked, and rarely do you hit off a flat lie. But it's when you get to the greens that the real adventure begins. They are medium-sized, with the kind of slope and undulation that'll have you scratching your head, your chin and anything else that signifies puzzlement. The greens are elevated and mounded, with deep collection areas. When the pin placements are close to the edges, putts can roll right off, and end up well off the green. Replace that putter with a lob wedge, but keep the flat stick handy -- you'll need it again. You not only have to hit these greens, you have to know where to hit them - where to be in relation to the slopes and undulation between you and the hole. Playing fast to boot (they rolled about an 11 in early spring), these greens will test the best putters. "The greens are probably the best, the toughest and the fairest I've ever seen," said Clemson golf coach Larry Penley, whose team competed in a college tournament here. This is one of the top-tier clubs in the Atlanta area, which automatically places it among the best golf courses in Georgia. Nearly identical in length (Lakeside comes in at 7,020 yards, Creekside at 6.967), both tracks are immaculately conditioned. 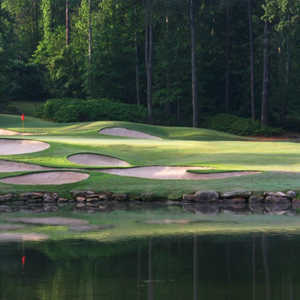 The membership, which owns the private club, likes to show them off; both have hosted the popular Georgia Cup, which has been shown on the Golf Channel. Lakeside in particular is a gorgeous course, especially in spring when the colors are exploding. The track really starts to come into its own visually on the back nine, exploiting the presence of Lake Windward. The lake frames the green nicely as you walk down the fairway of the par-5, 607-yard 11th, which Golf Digest listed among "America's best 99 holes." It is indeed a doozy.